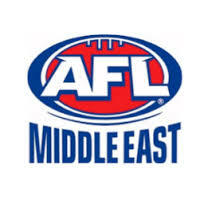 In one of the closest ever battles to reach finals in AFL Middle east history, the Multiplex Bulls are the first team guaranteed to play in this season’s decider. The competition returned from its winter break with a double header with the top four teams in battles which would possibly decide their 2016/17 fate. The first match saw a rampant Dubai Dragons go within an ace of guaranteeing their grand final spot when they downed the Abu Dhabi Falcons. Going into the match, both teams were in the mix, but the falcons are now out of contention with just one win from three matches and a poor percentage. The Dragons would have to be incredibly unlucky to fall from second place with a big percentage boost making them very nearly safe. In the later match, the Multiplax Bulls and Entertainer Dubai Dingoes played out a thriller. The match was vital for both teams, but arguably more so for the Dingoes. A win for the Bulls would secure top spot. A win for the Dingoes would see them equal with the Dragons in top spot and the winner of their Round 8 clash would go to the grand final. But the Bulls hung on by just three points to secure top spot and first team into the big dance, leaving the Dingoes the near impossible task of downing the Dragons by upwards of 10 goals to supplant them for a final berth. The remaining games will see the sole Round 7 clash between the Doha Kangaroos and Abu Dhabi Falcons. Then in Round 8 the Doha Kangaroos will host the Multiplex Bulls whilst the Dubai derby will see the Dragons and the Dingoes in what will be a fascinating match. The grand final will be held at Seven’s Stadium in Dubai on March 10th. At this stage it looks again like a Bulls v Dragons affair – but maybe the Dingoes can provide one last twist to what has been a very tense and exciting season.